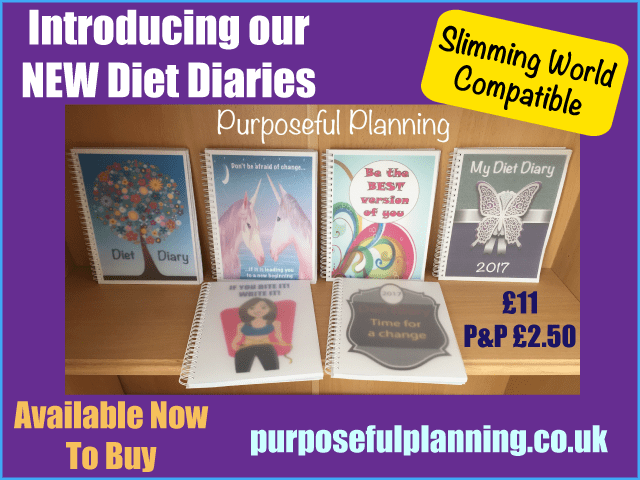 Introducing our NEW Diet Diaries compatible with Slimming World. Even the most difficult tasks can be made easier with a plan, so let Purposeful Planning help guide you to a successful result! Our diet diary journal lasts for one year and can be started at any day/week/month. With 52, week to view food logs to be able to write down the foods you have eaten, and the treats you may have to add up, weight loss trackers and graphs so you can clearly see how you are going, and a photo progress section to see your body changing to give you an extra boost, what is not to love! It can be hard to stay on track and often we forget what we have drunk, eaten, what we now weigh and our body measurements but our diary can store all of this information for you to make it easier to refer back to. Some days maybe better than others so on the week to view food logs we have included a today’s mood section then you can look back to which day’s plan worked well. Need to start an exercise plan? Not a problem we have a section in the diary to help you see how much exercise you would like to attempt each week time wise, you can choose whether to aim for bronze, silver or gold fitness level. All of these pages and lots more can be found in our NEW Diet Diaries and there are 6 front covers to choose from making your diary more personalised to you. What makes it even better is the price, just £11 for a 12 months diary and £2.50 First Class Signed For Postage cost.